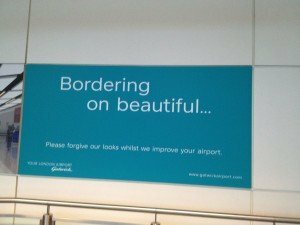 A major refurbishment is going on at Gatwick South terminal and ‘bordering on beautiful’ is one of the slogans proudly plastered over makeshift walls. I didn’t recognize it when the bus dropped us off. Instead of the usual unwelcoming, grungy dungeon we are normally dumped at, we were let out onto an elevated ramp, reaching up to the skies. Our eyes were in for a feast. The spanking new concourse was lit up with ambient banners of digital fruit colours that changed imperceptibly – alleviating the stress of starting a long journey from a London airport. A modern, vibrant and upbeat sign for Gatwick South was prominently displayed, with Aqua blue font. I was flying with Norwegian.com to Sweden – a low-fare airline that bizarrely flies from London to Stockholm. It is one of the more discerning ones, even boasting free Wi-Fi on board. On passing through the concourse, I noticed a bank of sideway facing Norwegian.com kiosks and – just like in the TV commercials – friendly, uniformed smiling faces standing besides them ready to assist and welcome every passenger on their way. Printing my boarding card was a breeze. More elegant, ergonomic signage swept me up the stairs into security. The space – unlike the previous cattle market of fighting travellers winding their way through chaotic lines – was airy, quiet and soothing against a backdrop of more ambient lights, fluxing pink, blue, green, yellow and orange. I was in heaven. Invisible, perambulatory paths continued to sweep us along until we reached a row of 19 glass-gated lanes with barcode readers, inviting us to slow down and step on yellow footprints. 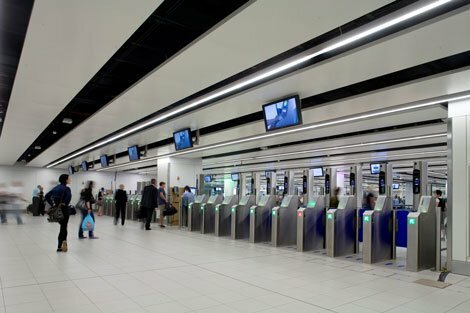 This is the face of the new border control, fully automated, and calming. Apparently, the new security system, if operating smoothly, will enable each passenger through in less than 5 minutes. So would it work for more me, to be whisked through to the other side? Sadly, no. There had to be a hitch somewhere in this smooth, soporific journey. The card reader did not recognize the barcode on my boarding pass. I turned it around and tried different ways of getting the black lines to line up with the red lines, peaking through the scanner. No luck, so it was off to find a human to help out. At Lane 1 of the starting line, I spotted an official looking man. He looked over at me and said, rather too gleefully, “I can see what’s wrong straight away”. I presume Norwegian.com did not know when buying the paper rolls for its boarding card machines that the lines of perforations (inserted for their boarding agents to tear easily into two bits at the gate, one they keep and the other given back to you to take on the plane) would line up where the barcode was to be stamped. I thought about chortling at this wonderfully simple, system error but thought better of it, as the man looked quizzically at me and then at my passport mugshot. One always feels vulnerable at such moments of comparative scrutiny, especially when bordering no-mans land. Meanwhile, a small queue had started to line up behind me, presumably with similar problems – the man was kept very busy. I was reminded of the person who is assigned to the cacophony of barking, self-checkout machines that have now taken over the cashier-staffed ones in our supermarkets, stores and newsagents. We all know the benefits to the retailer: it costs much less since only one attendant is needed to run a pen of 4-6 checkout tills at a time. But these new-fangled transactions are far from being beautiful for the customer. There is always something that a human needs to do when the machine comes unstuck or cannot be trusted – be it checking someone’s age, needing to remove the security top on a wine bottle, or rectifying cases of mistaken identity or non identify, such as deciding what a strange looking fruit is with no barcode label on it. Once through security I went off to potter, preparing myself for the two and a half hour flight. At WHSmith, instead of using one of the self-service machines to buy a magazine, I obdurately queued with lots of others to use the old fashioned way of making a purchase. A jolly man marched up and down besides us, a bit like a ticket tout, sarcastically repeating his smarmy tagline “pay over here – and you don’t need to queue.” Noone budged over to his row of empty self-service tills. We were all determined to pay a human, no matter how long it took. I gave her a puzzled look, indicating my concern at how were the security guards to know if I had paid for my magazine. She looked back at my look, and triumphed “ahhhh, there are loads of cameras everywhere”, raising her eyes to the ceiling. I followed them. Sure enough, there was an army of tiny roaming, drove cameras hanging from high; poking their swivelling lenses down at us. I wondered whether the now largely absent, human cashiers were being retrained as CCTV shoplifting spotting, experts. And I wondered, too, what I would need to do, now receipt-less and bag-less, to prove that I had paid for the magazine. But I did not need to worry – there weren’t any uniformed security guys at the front of the store to have to do any explaining to. The world of commerce and security has gone topsy-turvy. Anything but bordering on the beautiful.